The Athena is our cost effective durable solution for businesses who want power in an easy to use compactly designed package. 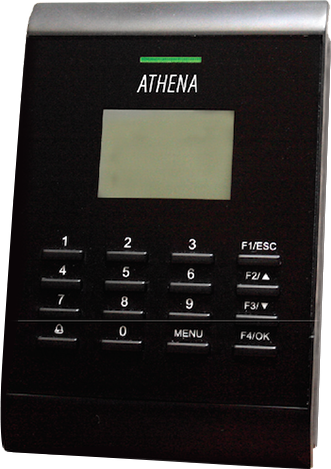 The Athena brings automated time & attendance functionality to you in a sleek compact design capable of tracking over 50,000 punch events and 30,000 card holders. Don’t underestimate the Athena because of her small stature and elegant design. The Athena not only accurately tracks time & attendance, but it can also be used for access control purposes. That means that this tiny machine can be used for your time & attendance needs and if you decide you want to secure a doorway, you can still utilize the Athena. The user also has the option of viewing their last recorded time, transferring departments, or entering other information like tips, miles, etc. The large LCD provides maximum readability, and the onboard speaker provides audible confirmation of a complete or incomplete transaction. In addition, data can optionally be downloaded directly from the Athena, via a USB disk drive making the Athena great for locations without physical connectivity. The Athena communicates via the standard TCP/IP protocol. This allows the Athena to be connected to any TCP/IP network and allow communication to InfiniTime. This allows the Athena to quickly sync with InfiniTime to provide accurate and timely data collection. The Athena is one of the easiest devices you and your employees will ever operate. Employees can operate the Athena in two ways. The first is to simply wave their pre-assigned badge in front of the Athena (within 10-15 cm). The second option is to enter their pre-assigned PIN number into the Athena. Successfully doing either one of these processes will trigger an audible tone and flash an LED light to confirm that the employee has been clocked in or out. The access control features of the Athena operate the same. Simply swipe or enter a PIN number to trigger the door to open. The Athena is capable of performing multiple roles in your organization. The Athena can be mobile, used in the field without physical connections, and data downloaded via USB disk, for transfer to the InfiniTime Labor Management System. The Athena can also be mounted to a wall for permanent time tracking in a single location. The Athena can also double as an access control device. This makes the Athena a versatile terminal, prime for a fast return on investment.